One of the greatest pleasures in my high-end journey was the opportunity to meet and visit with John Grado in Brooklyn at the Grado Labs facility. My experience with Grado products started in 1979 with the purchase of the Grado Black cartridge which cost $50 back then. Always happy with the performance of moving iron designs I was hooked on The Grado sound, which produced magnificent midrange and made my records come to life. Hence I jumped at the opportunity to visit the factory and meet with John Grado and his team. John told me his grandfather purchased the house in 1918 and has remained in the family since. The inside is a typical three-story home and serves as a factory where all Grado products come to life and are manufactured in the legendary Grado tradition. I mentioned to John that my life with high-end vinyl started in 1979 with a NAD table and the Grado black cartridge. The sound from that magical cartridge was intoxicating and loaded with musicality. Listening to “Dark Side of the Moon” the cartridge omitted little and highlighted the midrange and was exceptional with musicality. Growing up using cheap tables and sub standard cartridges, I was unaware of what was possible with vinyl records until I experienced that moving iron Grado and my life changed and the journey still continues to this day. John mentioned that the cartridge was still being manufactured and asked me to compare it to the Ortofon Black 2M that I currently use with the VPI Scout turntable. I used it with the VPI Scout review and compared it to the more expensive $750 Ortofon and I mentioned to John the Reference Sonata V2 priced at $600 would also be a great comparison against the Ortofon Black 2M. John agreed it would be a great comparison and sent me the cartridge. I had planned to have this review done in October but life circumstances with my daughter Michelle required my attention. I told John I was in the hospital with Michelle who was in serious condition and had become critical that I had to put off the review until she was better and I was out of Children’s Hospital in Philadelphia. John understood and told me to take care of my family and he was compassionate and understanding and I appreciated his patience. He had also sent me the new GS3000E cocobolo headphone that was also to be reviewed. After missing almost three months my daughter recovered after having her mitral valve replaced and I was able to come home and start working on the Grado experience. Mat Weisfeld the owner of VPI provided me with a second arm to use with the Grado Black cartridge review. I called Pat Matucci from HiFi Sales in Cherry Hill NJ to mount the Sonata to the uni-pivot arm and set the tracking as setup is out of the realm of my expertise. He checked the tracking and the wood-bodied cartridge weighed in at 10 grams and the recommended tracking was 1.5 grams. Pat set up the cartridge masterfully and the Scout with the Sonata V2 was ready for listening. Once the setup was completed the session began with Frank Sinatra’s“In the Wee Small Hours”. Once the session began Pat looked at me and we both had a big smile on our face. Sinatra was defined in his own space with excellent transparency and razor-sharp imaging. The pristine vocal had clarity and inner detail with a lifelike in the room presence. The soundstage had all the musicians in their own space and the imaging was spectacular as was the front to back depth and width of the stage. Pulling out “Louis Armstrong Plays King Oliver” showcased how good the Sonata V2 was at reproducing treble extension. Pop’s horn sounded transparent and had bite but was never harsh while playing “St James Infirmary”. Once again I was treated to in-room presence of the artist coming alive in my room. The sound was musical and again the Sonata V2 was able to captivate me and keep me focused on the music. The sound was almost mystical and Pop’s vocal was exceptional and realistically reproduced and the sound of live music was once again in my listening room. Van Morrison “Miss Otis Regrets” from his “You driving me Crazy” collaboration with Joey DeFrancesco was another recording I enjoyed immensely while listening with the Sonata V2. The sound was exceptional and the vocal once again sounded crisp and alive. DeFrancesco’s horn never had any harshness and his organ was masterful and musical. The treble showed no signs of brightness while playing this masterful tune. The well balanced performance showcased the soundstage and the musicians were spread out and the vocal performance from Morrison was crisp and alive and sounded realistic with excellent clarity. Pink Floyd’s “The Wall” is an excellent album and has some great tracks. “Comfortably Numb” was a revelation of what was about with the Sonata V2. David Gilmour’s guitar came alive and the vocal was exceptionally reproduced. The guitar imaging was sensational and the Sonata V2 had rhythm and just got out of way and made the listening experience memorable. Listening to “Bohemian Rhapsody” from “A Night at the Opera” was another memorable performance. Freddie Mercury performances are always a treat to listen to and the sound of the masterpiece with Roger Taylor and Brian May performing is outstanding. The soundstage was spread out and the Sonata V2 brought Freddie and Queen to life. The dynamic performance was masterfully reproduced and my time listening was a memorable experience and I always felt as if I was listening to a live memorable performance. Reference Sonata V2 and Ortofon Black 2M Comparisons. Using the same recordings with the Ortofon Black 2 was easy to do since I had two identical unipivot arms and simply required me to swap out the Sonata V2 arm. The Orton had a slight edge in detail retrieval and the Sonata V2 had better tonality of instruments and a more in the room forward presentation. The Grado Sonata V2 is exceptional with reproducing vocals and has an excellent soundstage. Listening to both I was impressed with the Sonata V2 ability to recreate vocal performance and gave it a slight edge over the Ortofon Black 2M. The Black 2M was better with retrieving inner detail but the Sonata V2 was also excellent with both and the differences were small. 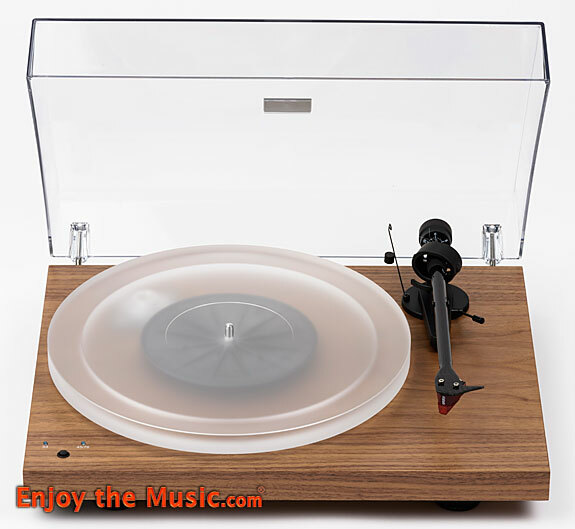 Both cartridges are excellent with the VPI Scout and both are outstanding musical transducers. The Grado Sonata V2 priced $150 less is an exceptional value and has terrific synergy with the VPI Scout and highly recommended. Offered at $1795 the Grado GS3000E competes in reference territory with many other premier luxury brand headphones. Designed with exotic and beautiful cocobolo wood it was a first for Grado using this exotic wood with a headphone. The Cocobolo wood is found in Central America. Grado used the wood in their statement Epoch and Aeon cartridges. The sonic sound quality from the two reference cartridges inspired Grado to use the wood on their new GS3000E. They felt the sonic quality the cocobolo proved to be exceptional and wanted to make it available for the first time in Grado headphone. The GS3000E is a comfortable and light design that has excellent specifications. The 32-ohm driver paired nicely with my reference Auris Nirvana tube headphone amplifier. The Auris is magical with the reference PS2000E so I felt it would be an excellent match with the GS3000E and set the setting to 32 ohms on the amplifier. The Nirvana is a master at detail retrieval and musicality and felt right at home driving the GS3000E. The transducer comes with the standard Grado designed non-removable cable but can be custom fitted by expert cable designers. Drew Baird at Moon Audio offers cable modifications for listeners looking for a custom-crafted cable. The headphone has the cable extension cable if you require a longer cable, included with the headphone. Once the setup was complete I ran a few test tracks and found that the GS3000E was good right out of the box with no break-in time. Past experiences told me that if it’s good out of the box it usually will get better with hours and will be a winner. Excited to start my listening session I set the Marantz SA10 DAC and hit the play button to start my listening session. Listening to Diana Krall’s MQA recording “All or Nothing at All” on Tidal the GS3000E had excellent vocal presence. The GS3000E was magical with that same in the room feel that I had experienced with the Sonata V2 and the PS2000E. Diana’s vocal was articulate and completely sibilant free. I could hear detail in her piano playing with excellent definition. The hands gliding over the piano keys and the sound of the wood resonating from her piano was all highlighted in a defined space. I closed my eyes and visualized her in front of me performing. The imaging that the GS3000E was producing was spectacular. Switching to her “Love to Stay” album with Tony Bennett was a revelation in transparency and detail retrieval. I could hear drum brushes within the soundstage clearly and the delicate sound of the brushes against both skins and cymbals was vivid and clearly defined. Bennett’s vocal came to life. Tony was transparent in singing “My one and Only”. The duo sounded in unison and Tony’s vocal was clear and articulately reproduced. The piano was magical and Diana kept playing and the sound was spectacular. Impressive was Tony Bennett’s vocal which has not lost a beat and continues to sound ageless. Bruce Springsteen’s “Springsteen on Broadway” was a show, unfortunately, I couldn’t get tickets to in the lottery system they used. The tickets on the resale market were exorbitant and out of my budget. Fortunately, Bruce released this amazing show on CD and Tidal streaming. Using the SA10 CD transport on the Marantz and listening to the entire performance the GS3000E took me to the show. Turning the volume up a notch, the sound was vivid, alive and transparent. The GS3000E continues to amaze me and I always felt as if I was at the show and could be engulfed with the performance. The experience was magical and my wife was getting a kick of how involved I was while listening to this magical performance. I felt as if I was there in the theater at the show and the GS3000E made this performance unforgettable. And the experience was truly special. The sound was also enlightening as it took me to the show and showcased the performance and sounded live as if I was there and the transparency of the driver is exceptional at recreating space. The Mercury Living Presence recording of Tchaikovsky’s “Swan Lake” is an excellent recording. The sound of the orchestra was layered and had excellent spacing between performers. The sound was fast and dynamic and had excellent transparency. The orchestra was defined in a layered soundstage with exceptional space and imaging. The classical recording was exceptional. The GS3000E was fast and was able to start and stop when the music called for it and always delivered a musical experience while listening. Classical music requires a fast transducer that is capable of starting and stopping and the GS3000 was able to reproduce the orchestra masterfully. Madeline Peyroux’s MQA recording “Anthem” on Tidal is a well-recorded gem and “Down on Me” showcased the GS3000E dynamics once again. The track had Peyroux’s powerful vocal crystal clear and articulate in her delivery. This dynamic tune had my body moving and the GS3000E once again delivered a majestic performance. Forty Years after discovering Grado products I continue to be amazed by the musicality of their cartridges and headphones. The magical sound of live performances always captured my imagination and the sessions were always a spectacular listening experience. The Sonata V2 is an exceptional performer that omits little in the presentation of recorded music. Long listening sessions, countless hours of listening it always had me captivated. The Sonata V2 was always faithful to the recording and delivered exceptional performance, bringing musicians to the room is always a difficult assignment for any cartridge but the Reference Sonata was able to recreate performances and make them come to life easily. The Sonata V2 biggest strength for me was vocal performances as I continued to become totally consumed with the beautiful sound the V2 brought to my room. The exotic GS3000 E with its cocobolo wood design merits consideration for music lovers who want to hear inner detail and decay of instruments. The GS3000E is a design that makes listening to music a revelation. While listening to Springsteen On Broadway Live the GS3000E captured the sound of the theater and made it sound as if I was actually there at the performance. The decay of Bruce’s guitar strings was present and the sound was both inviting and took me to the venue. I was able to listen in entirety to the performance and never felt I was missing anything. Grado once again continues to move the needle forward and deliver exceptional products that not only compete but also set new benchmarks. If you looking for value in high-end design both of these products merit your consideration. Whether I was listening to vinyl or digital recordings, both the reference Sonata V2 and GS3000E always brought a smile to my face and delivered exceptional musical performance. If you’re looking for the ultimate musical experience you need to audition the Grado Reference products and you may find as I did that they will captivate and astonish you with their musicality. Highly Recommended.